When you try and keep up with the continual stream of new releases that come out in any one area of music you are bound to find that you have more music than time to listen. This is very much the case for me. However over Easter I managed to get four days together when I did little else but listen to music (a LOT of music) and for the first time in about a year managed to clear the stack of unlistened to CDs that usually inhabits the end of my desk. I have a simple rule here that unless something is absolutely awful I will listen to it at least twice before it leaves the desk and gets filed away on the shelves. (The really awful CDs get used as coffee coasters) Clearly though, two listens isn’t enough, and so there are probably plenty of gems on my shelves that I have passed over without properly listening, but thats life, I do my best. On these rare occasions that I do manage to clear the decks however I really enjoy taking some old favourites down from the shelves to give them another spin. Yesterday evening I dozed off with AMM’s Before driving to the chapel we took coffee with Rick and Jennifer Reed on its second spin of the night. 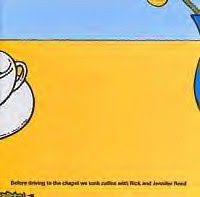 Whilst maybe not the very best AMM album, Before driving… is a great record, taken from a 1996 tour of the USA and from a period of time when the AMM trio were making great music. Only the prescence of a few too many dramatic drumrolls from Eddie keeps me from rating this set amongst the very best from the classic AMM trio line-up. A few days back I pulled a couple of other classics from the shelves in one evening. 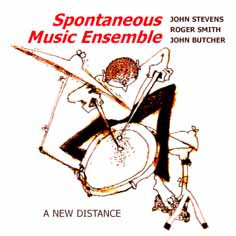 Firstly The Spontaneous Music Ensemble’s great 1994 recording A New Distance on the Acta label got a rare play and made for a really fine listen. The first half of the disc was recorded at an early LMC Festival way back in ’94 which was actually the first LMC festival I attended, and a show that left a considerable mark on me. That was the only time I got to see the great John Stevens play live, which is a massive shame, but I’m very pleased to be able to say I managed it once in my life. The other oldie but goodie from that evening was Burkhard Stangl’s Ereignislose Musik – Loose Music release, also from 1994 on the sadly long obsolete Random Acoustics label. Loose Music is made up of four Stangl compositions that are scored for a group called Ensemble Maxixe, a thirteen strong group put together by Stangl to play the work that included all four members of the original Polwechsel line up amongst their number. Loose Music sits very firmly in the category of Modern Composition, strong aggressive sections of music spaced apart by longer, sometimes improvised passages but always retaining a sense of control and precision in its execution. Pretty much everything can be heard here, from massive large group flourishes to the unmistakable sound of Radu Malfatti’s minimal trombone, yet all of the CD is equally involving and exciting. Not sure you are likely to find a copy of this unless one comes up on eBay though. 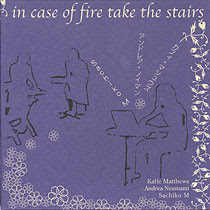 Tonight as I sit here late typing this, Kaffe Matthews, Sachiko M and Andrea Neumann’s In case of fire, take the stairs is buzzing and spluttering away quietly in the background, a very good disc indeed on the Improvised Music from Japan label. From the golden era of IMJ this trio is a fantastically understated recording of three musicians playing together for the first time, and somehow hitting top form at the first attempt. I have been listening to a lot of Neumann’s work this last fortnight since seeing her play a fantastic couple of sets at the Dublin i and e festival, and I think this is possibly her best performance on a released CD so far, a mixture of low drones, prickly sinewaves and scratchy interventions with plenty of room left for big chunks of silence. Sometimes we all need these little excursions back into the music we love but don’t have enough time to actually listen to remind us that the continual struggle to keep listening to new music does turn out the odd masterpiece every so often. As I type this the beautiful tinkling piano strings and sinewave ending to In case of fire… has come to a close, the room falls silent and the disc can go back on the shelf until its turn comes around again. Happy times. Like the new look of the blog (wish I could make my text display wider) and the flurry of posting. Some good classics here in your relistening, I myself listened to In Case of Fire, Take Stairs just a couple of weeks ago. When I buy a lot of CDs (and I know I’m barely buying at all compared to some) it really does seem to be a lot more of a couple of listens and file for a while. Then the more you get the less time there is to revisit. It becomes this thing where it seems like its more important to hear music then to really listen to it. Speaking for myself here, I definitely find that its better when I only get a couple of things a week (or month even) so it gets a decent amount of listens and I’m also hitting the library all the time. This is something that has been a bit reinforced for me with the new stereo – there is so much better stuff in my library then anything that’s come out lately. Yeah I’ve been very aware for quite some time that the amount of music that enters Pinnell Towers is really too much to properly absorb, but somehow I don’t think this will change. I regularly walk into Sound323 with the intention of buying perhaps one or two specific discs and end up leaving with a dozen (and usually not the ones I went in for either!). My solution is to find more time to listen, which I’m working hard at now. I do have a scribbled list by the side of my stereo that I add to every time I think of something I really need to take down and listen to again, and it was in fact you mentioning to me the other week that you were playing “In case of fire…” that caused me to addd it to the list!